Home / What is Semisitting? Semisitting is the first dynamic working seat which facilitates the position change, adapting itself to all the situations that may be developed in a seated position. The position change, which may be difficult in reduced space and standard seats, is the natural answer when the muscle and joint discomfort appears. Semisitting fits the user morphology allowing them to adapt their position to any working activity that they may develop. Ergonomics, Postural Health, Mobility, Adaptability, Risks Prevention and Security in the working position…All these concepts are increasingly more important to our society, Health Institutions, Organisms and Social Agents, Public and Private Administrations, etc. Semisitting is a unique and differential product that combines all these concepts and improves the user well-being in the working place and at the same time allows more effective results in the working activity development. El Instituto de Biomecánica de Valencia (IBV) [The Biomechanich Institut in Valencia] is one of the institutions with the highest recognition in the European Union in I+D+I. It was founded in 1976 and it works with coordination with the Polytechnic University of Valencia (PUV) and collaborates with different Administrative Institutions of the State and public and private companies. The IBV was the centre we applied for the analysis, study, design and development of what today is Semisitting. A team of highly qualified professionals made an impressive work reflected in a really broad scientific project, based in the ergonomic concept of the position change, developing an innovative solution of a dynamic seat for the semi-seated position that may cope with the demanded necessities by different industrial, commercial, professional and facilities sectors, based in the innovation of the design, well-being, health, security, versatility and efficiency in the work position. The project starts with an extensive ergonomic study in the job position standing and seated and the problems that may result from prolonged periods in both positions. The current proposals in relation with the semi-seated position were analysed and the advantages and disadvantages of foresaid proposals were defined. From this analysis we developed and defined how we could improve the advantages and minimize or avoid the drawbacks. The result of 10 months of work resulted what is today our Semisitting. 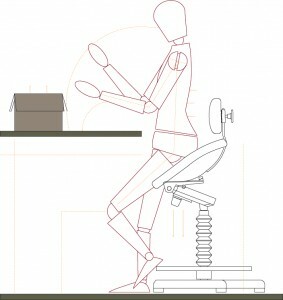 The design of Semisitting is innovative due to the fact that gathers the benefits of work seated allowing a great mobility and accessibility in addition to the advantages that the work standing contributes both in the industry and the trade, technical professions, professionals and facilities. This new concept breaks barriers of semi-seated traditional stools, usually conceived as mere support and combines the mobility of these seats with the comfort and stability of a traditional chair. Its design changes the dominant trend due to the fact that is the user who is adapted to the product and not the opposite. 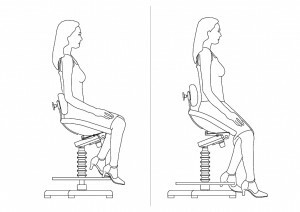 To achieve this, Semisitting returns to the concept of a large, comfortable seat that does not cause fatigue or discomfort, supported by a fully adjustable height axis that together with an extensive range of optional elements allow to personalise and adapt the chair/stool (height, inclination, pressure, etc.) with the aim of maximize the adaptability of the chair to the workers in their work position. The result is an absolutely comfortable unique versatile and with high mobility seat, ready to use for a wide range of users in different jobs.